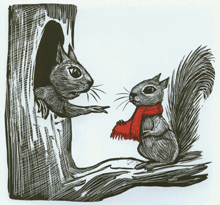 "Warm and welcoming as she opens the story, J.J. Myers draws the listener into Freeman's fanciful world of gray squirrels. Who would think that a squirrel might lack confidence in finding acorns, that a sympathetic human might offer solutions, or that a squirrel-chasing bull would provide the most help? Myers is unobtrusive as narrator, indignant as Mother Squirrel, gruff and mysterious as Owl, and reticent turning to confident as Earl. Myers's brisk pace keeps Earl's quest moving, and her inflection heightens suspense. Young listeners will take pleasure in Freeman's story of finding oneself and enjoy his energetic illustrations." "Young squirrel Earl is helped by his human friend, Jill, who gives him an acorn and a nutcracker. Earl's mother fears that her son is too dependent on his friend. But Earl uses another gift, a red scarf, to prove he can make his own way in the world. Written and illustrated by the late Don Freeman, best known for the classic Corduroy (1968), this read-along has enough action and humor to engage youngsters. Myers' narration and natural background sounds perfectly complement Freeman's wry tale and black-and-white scratchboard illustrations (the red scarf is the only splash of color). Well-managed vocal changes for all characters - ranging from squirrels and a haughty owl and an angry bull to Jill - help this story leap from page to ear. Perfect for autumn story hours and for introducing youngsters to familiar animals in the wild. book."